A small portion of RV enthusiasts purchase vintage camping trailers as a restoration project and, as an end result, will own a quality-built camping trailer with a unique charm. Back in the early 1900's inventive individuals attached wooden, shed-like houses onto Model T Fords. By the 1920's, people towed "tin lizzies" behind their cars, and in the 1930's some vintage camping trailers were equipped with amenities like simple plumbing and electrical systems. Post WWII brought about improved roads and a time of economic prosperity which stimulated manufacturing. By the 1950's, camping trailers enjoyed advancement in tow trailer designs sporting modern conveniences like refrigerators and in some trailers complete kitchens. It didn't stop there. Soon, the creature comforts typically found at home, could be found in a number of camping trailers. Travel trailer popularity increased and by the early 1960's manufacturing exploded along with the size and length of camping trailers. 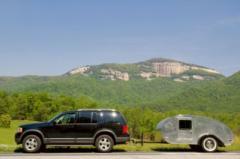 Research will aid you in choosing a travel trailer right for your personality and camping needs. Today, the Internet offers several websites dedicated to those who enjoy vintage camping and to connect with others with similar interests and services. Some enthusiasts buy vintage trailers for the classic look, but another benefit to owning a classic camping trailer is the quality of construction they provide. You'll enjoy hours of fun, and an opportunity to pass on lessons from the past. Back when these trailers were originally built, manufacturers used real wood instead of cheap synthetics. People lived simpler lives. Another benefit of owning a vintage trailer is that in the long run, they increase in value. Plus, they also look great in tow. Restoring a camper to its former glory presents an emotional reward that for some is almost spiritual. However, you'll want to be sure you have the skills necessary to complete the task. If you are inexperienced, it's wise to seek professional advice or services as you prepare to take on a restoration project. Instead of attempting to restore the camper all at once, it helps to break the restoration process into smaller projects. Plan these projects during the months when you won't be using the trailer. This keeps the trailer functional during camping season, and will encourage the long-term restoration project as you enjoy the fruit of your labor. If you break restoration into these smaller projects, it also helps keep the cost manageable so you can have enough money to enjoy the camping season. How much work you want to do or are willing to pay to have done. Whether or not you expect to take the trailer to use in the upcoming camping season. What works and what doesn't function? What items can be repaired? What is the ballpark cost for repairs or restoration? The tradition of family camping in trailers has been passed on from generation to generation for several decades. Whether you buy a refurbished classic trailer or a vintage trailer as a restoration project, it's a great way to build your own family camping tradition.